Modern office space is becoming harder to find in Vancouver, which may spur some developers to try to accelerate projects in the planning and permitting stages. The Exchange building is the latest addition to the Vancouver office market. “Demand is getting stronger and supply is constrained,” said Michael Wright, vice-president of Newmark Knight Frank Devencore, which just released a new study on Vancouver’s office market. “So in the short term, vacancies will go down and rents will go up and inducements will stay the same or begin to get compressed. The largest tenant transactions over the first five months of the year were: WeWork’s commitment to almost 80,000 square feet in the Anbang Insurance Group-owned Bentall Centre’s Bentall III; and a deal with Executive Group Development to convert approximately 110,000 square feet to hotel use in Credit Suisse’s spec-built $240-million The Exchange building at 475 Howe St. The hotel will occupy the second through 11th floors of Vancouver’s first LEED Platinum tower, which has 31 storeys. Until recently, National Bank of Canada’s commitment to take 45,000 square feet (including street-level retail) was the only one for the office space. It was announced on Wednesday, however, that: a Vancouver accounting firm will be headquartered in the building, with approximately 28,000 square feet; and a local financial technology company that’s expanding from its existing premises will occupy approximately 22,500 square feet. The Exchange is scheduled for completion by the end of the year and still has 165,000 square feet of office space available for lease. “It’s a good building and it’s sort of the last game in town right now that’s got some good contiguous space in it, if you’re looking for a larger block,” said Wright. 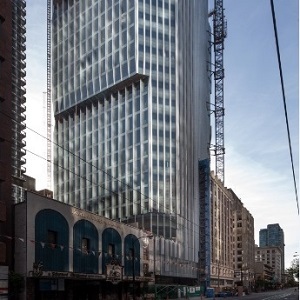 Of the two other new office projects, Serracan Properties’ 10-storey, 71,000-square-foot Five Ten Seymour is approximately 90 per cent pre-leased, and Century Group’s four-storey, 25,000-square-foot Ormidale Block at 151 West Hastings St. is fully leased. Tenants in the technology, finance, professional services and hospitality sectors are driving the recent leasing activity. The overall vacancy rate stands at 7.1 per cent, down from 8.7 per cent a year ago. The decline in supply has put pressure on average gross rents, which currently stand at $41.76 per square foot, compared to $40.73 a year ago. “A lot of the improved space has been leased, so large blocks of space are more challenging to come by and the space that is available often is comprised of older space in need of improvements or in shell condition,” said Wright. “What that means is that there is a larger capital investment required for tenants moving into that type of space, which can make it a little trickier given how careful everybody is in this business environment. “Landlords will offer inducements on those types of spaces to subsidize the capital expenditure required. It differs from landlord to landlord, but some fairly substantial inducements are being provided. Westbank has applied to rezone a Budget Rent A Car site at 400 West Georgia St. Wright said the company is looking to move up completion of its proposed 24-storey, 350,000-square-foot office and 5,775-square-foot retail building to late 2019 or early 2020. Construction has begun on One Burrard Place, a mixed-use development with up to 150,000 square feet of space in a 13-storey class-A office building and 394 residential condominium suites in a 60-storey tower that’s scheduled for completion in 2019 by Reliance Properties and Jim Pattison Developments Ltd. The east tower of Aquilini Development’s Rogers Arena Towers at 800 Griffiths Way, a mixed-use building with 69,000 square feet of office space, is slated for completion at the end of 2018. * and QuadReal’s redevelopment of the Canada Post site at 349 West Georgia St., which comprises a full city block and has plans that include 512,000 square feet of office space, 274,000 square feet of retail space, rental apartments and condo units, and six levels of parking for cars and bicycles. A formal application for rezoning has been submitted. Burnaby and Richmond are the two biggest office markets in Vancouver’s suburbs, and vacancy rates have dropped in both during the past nine months. “When new development came on in downtown Vancouver, there was a fair chunk of new development in Burnaby as well,” said Wright. “Demand was going south and supply was going north, so that market softened.